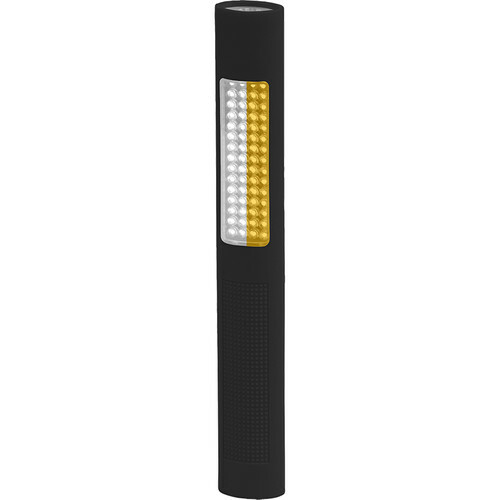 Combining an all-purpose flashlight with a traffic control-style safety wand, the Nightstick NSP-1174 LED Safety Light/Flashlight is ideally suited to a wide range of professional and recreational uses. Click the upper side push-button switch to control the flashlight with either momentary or constant-on activation. Click the lower switch to control the wand functions. Choose floodlight mode to turn just the white LED array on, or activate the amber LED array into its flashing strobe mode to really get the crowd's attention. For added versatility, you can activate both the flashlight and safety wand. The engineered polymer housing has a textured, soft-touch finish that's comfortable to hold. The housing is also IPX4-rated against rain and splashing water and impact resistant to 6.6' so it will stand up to whatever job you ask of it. Rounding out its features, the light comes with two handy attachment accessories—a magnetic clip to position the light for hands-free use and a lanyard ring.